The 2017 World Cup, and India playing in the finals, was the moment when Indian Women’s Cricket finally arrived. That it was mostly a gender stereotype that kept this sport from being taken seriously as something women could excel in is a sad thing. India has been gradually led, by the example of other cricketing nations, to offer it patronage and facilities. Similarly, other sports such as Wrestling, Shooting, Boxing, Kabaddi, Fencing, Tennis, Badminton, even Athletics and Gymnastics, in which Indians are making their mark consistently now, are also joining in on the benefits and national prominence at last. India did not win Gold at the 2017 tourney, missing it narrowly, as it went to England, but they did win Silver, at the semi-finals, beating the Australian Women’s Team. India had also managed to reach this high once before, in 2005, losing the final, as it happened, to Australia that time. Subsequently, officialdom seems to have made up its mind. The BCCI, that has been sponsoring international tours since 2006, got to work to turn the women’s team into more than the forever “feisty underdog”. The women’s annual retainer was tripled to Rs 50 lakh a year for the top players. TV rights for both men’s and women’s cricket, a lucrative game changer since the eighties and nineties, were sold for thousands of crores for a five year contract starting in 2018. India, said an ICC survey, wanted to also see their women cricketers playing. Coaches and other support staff were given two-year contracts. In the 12 months after July 23, 2017, the Indian Women’s Team played nine ODIs with four wins and five losses. In T20, India won eight of 15 international matches played. But it lost the Asia Cup for the first time since 2004, to a resurgent Bangladesh. There are shortcomings. India is still struggling to unearth new power hitters even as star player Mithali Raj is the most-capped player and most-capped captain in ODIs in 2018. There are other champions like Harmanpreet Kaur, who was the the first to sign up with an overseas T20 League (Sydney Thunder for the Women’s Big Bash League) in 2016. And Jhulan Goswami, who has captured 300 international wickets through her career so far. Team culture and cohesion too needs to be worked on. But how long, in the era of the fitness and coordination of a Virat Kohli led men’s team, will it take before the women’s team too become world-beaters? It stands to reason that Women’s Cricket should forge ahead to become world champions as training, skill, talent, new bench strength and fitness are being emphasised like never before. Meanwhile, Indian men’s cricket has become the biggest sports money-spinner in the world next to international soccer. This is primarily due to the size of Indian audiences both at the stadium and on TV, and, of course, the associated advertising revenues. That the male players are now paid small fortunes for ODI, T20 and Test Cricket with grueling and busy calendars, and earn much bigger sums via multiple endorsement deals organised by sport star management firms, puts them on par with the big stars of the silver screen. 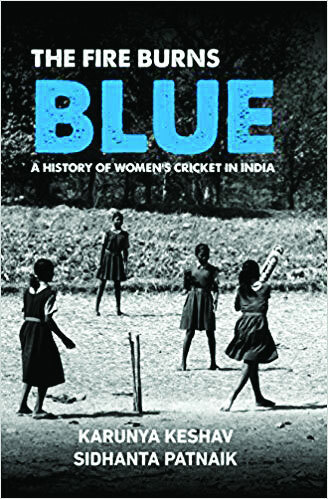 The authors of this book Karunya Keshav, a former Wisden and ICC reporter, and Sidhanta Patnaik, also an ICC reporter, have set out a chronicle of the long struggle to establish Women’s Cricket in India from the 1970s onwards. It describes many memorable games and their highlights over the years, the early stars and their considerable grit. The first Women’s Cricket Clubs were set up in Mumbai, Pune, and Chennai in 1971, when all three places had different names and women’s cricket had to fight in the face of low administrative support and funds crunches. The Indian Railways, with their multiple railway colonies that spawned talent, were early sponsors of Women’s Cricket teams. Early pioneers of the sport included names like Diana Eduljee who still plays an administrative part via the BCCI, and Shantha Rangaswamy, India’s first Captain. The Fire Burns Blue reads for the most part like a cricket commentary in the classic mould from the radio days of the fifties and sixties, even though Women’s Cricket commenced only in the seventies. Here is a description for the cricket fan from the last day of the second Test against England at Jamshedpur in 1995 — “ India needed someone to play a few bold strokes at the top before the ball got older and started to grip the surface”.